The idea of using a crock pot is to make your life easier. Not much is easier than enjoying this stew with your family. 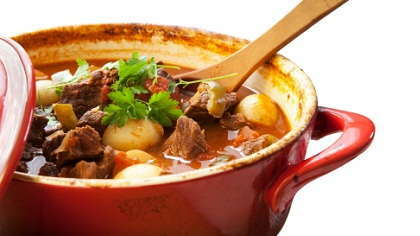 An easy recipe to make hearty stew. It is great for a family pot luck. Step 1-Steak should be 1 1/2 inches thick, cut into 1 1/2-inch cubes. Step 2-If beef is extra lean, thoroughly wipe cubed beef on absorbent towels to dry. If meat contains fat, quickly brown in large skillet to sear and remove fat; drain well. Step 3-Place beef cubes in crock-pot. Combine 1/3 cup flour with the salt and pepper; toss with beef to coat thoroughly. Add all vegetables except tomato wedges to crock-pot and mix well. Combine beef broth, 1/2 cup water, sugar and Kitchen Bouquet. Pour over meat and vegetables; stir carefully. Add drained tomatoes and stir well. Cover and cook on low setting for 10 to 14 hours (on high setting for 4 to 5 1/2 hours). Step 4-One hour before serving, turn to high setting. Make a smooth paste of 1/4 cup flour and 1/4 cup water; stir into crock-pot. Cover and cook until thickened. 8 to 10 servings.